A clearer picture of Precise’s service offering, combined with a redefined user journey, has seen a 65% boost in organic traffic, and a 114% boost in traffic overall. Precise have been providing electrical and data installation services since 2000, working across the country and in a wide range of sectors – with clients as diverse as their local town hall, Carlsberg’s UK warehouses, and the Thames Tideway Tunnel. They have a reputation for quality, whether they’re providing emergency lighting for a school, or a full data and telecoms infrastructure for a blue-chip company. Over the years, Precise have built a successful business primarily through word of mouth – the quality of their work speaks for itself, and it gave them a strong reputation in their industry. However, industries change, and as facility management companies have grown, Precise were struggling to get in front of the end users that make up their client base. The biggest issue was that their website wasn’t up to scratch anymore – it didn’t really offer a single point of contact for the headteachers, bursars, IT managers, estate managers and factory owners they like to work with directly, and it didn’t communicate their services effectively enough either. Time for a new one, then! Precise provided copy for us, so our focus in the planning stage was on determining how it would fit into a sitemap, and defining how we would direct users towards contact touchpoints – giving end users an easy way to reach out to Precise without going through a middleman. CTAs and forms are used throughout the design to make this user journey very simple. The company had undergone a rebrand itself, with a new logo and corporate colours that they were already using on their vans. 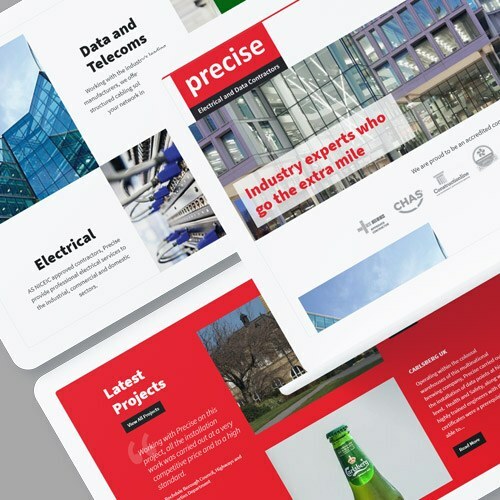 They had kept things very simple – bold and straightforward – so our designer took the same approach to the website design. Precise pride themselves on getting things right first time, undertaking projects for a fair price, and providing a high quality of work for a very technical service. The website needed to communicate this clearly – an overly flashy design would have betrayed Precise’s no-nonsense approach. The site is very bold, with large blocks of content and image sliders, and text that is very easy to read and digest, giving a very clear image of the service offering. The site is built in WordPress, so the back-end has a full content management system (CMS) for the Precise team to add new blogs, service pages, and project case studies. The Projects page has a custom filter, allowing users to view by sector and service. Contact forms mean the website can generate leads more effectively, and these go direct to the Precise sales team. The site is very easy to use in both the front-end and back – it’s a simple user experience for all involved, allowing Precise to focus on giving their customers what they need. 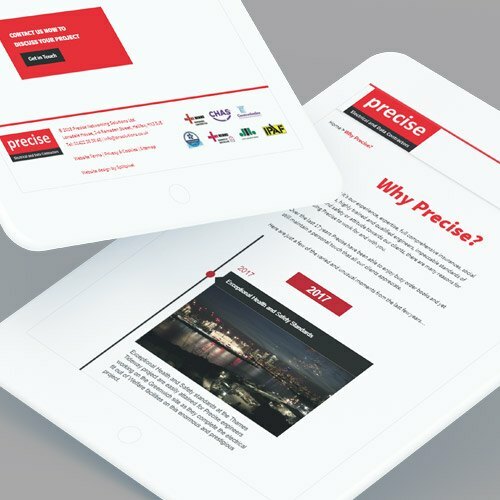 We’ll be continuing to support Precise with managing and updating their new site – we’re always on hand if our clients have any problems!